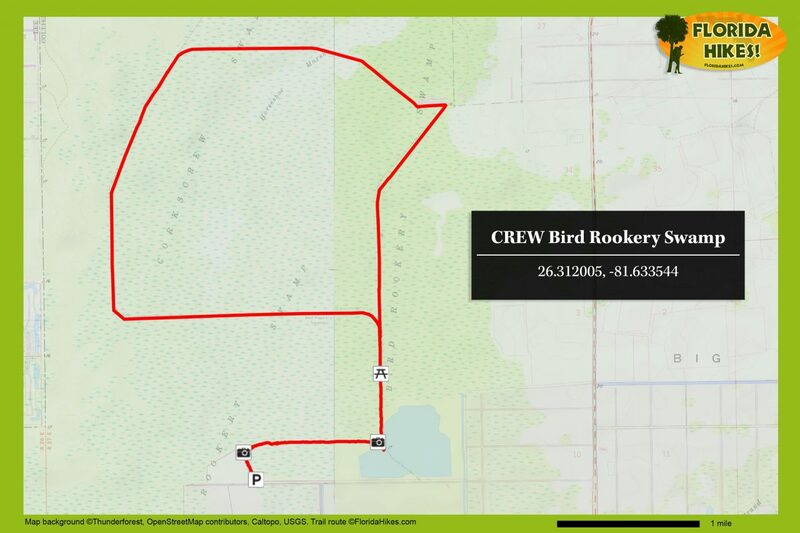 CREW Bird Rookery Swamp | Florida Hikes! Part of the vast Corkscrew Regional Ecosystem Watershed (CREW), more than 50,000 acres of hydrologic protection for Corkscrew Swamp Sanctuary, the CREW Bird Rookery Swamp provides a place for hikers to immerse themselves in the Big Cypress Swamp without getting their feet wet. 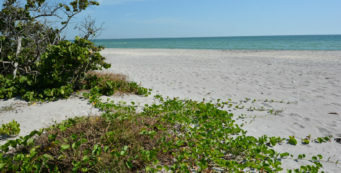 Just in a visit to the trailhead you’ll see abundant wildlife in the surrounding waterways, from ibis and wood storks to green herons and the ubiquitous alligators. 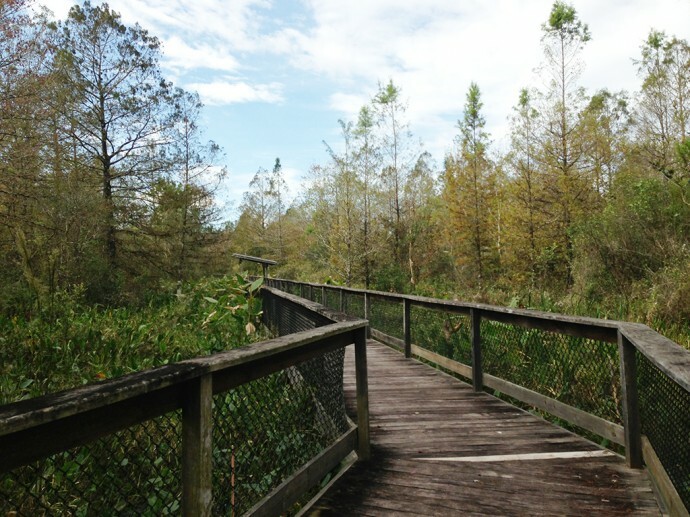 Most visitors will be satisfied exploring the tail end of the loop, a 4.5-mile round-trip, but with 12 miles of trail to explore, the tramway system into the swamp is open to both hikers and cyclists. Do not bring dogs to this trail. Young children should be closely watched. 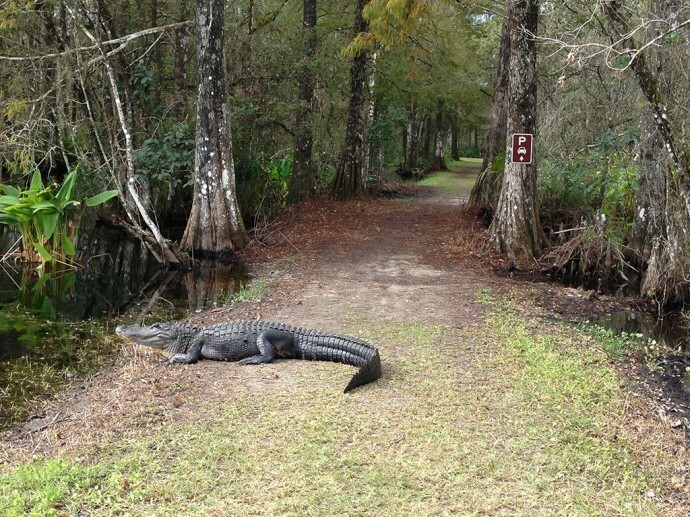 Be continually aware that you are only inches above the swamp on the trails and alligators do sun themselves on the footpath. From Interstate 75 exit 111, Immokalee Rd (CR 846), drive east for 11.4 miles, passing the stoplight for Oil Well Rd before you reach Shady Hollow Blvd on the left. Turn left and follow the road, which turns to dirt, for 1.5 miles to the trailhead parking on the right. After spending a little time wildlife watching around the trailhead – where alligators are always lurking – follow the causeway east from the parking area towards a boardwalk that lead you to the tramway system. Built to remove ancient cypresses for timber, the tramways supported a narrow gauge railway system for the timber companies, and now provide a place for you to walk on mostly-dry land in the middle of this vast swamp. Turn right to begin the boardwalk, which winds for a quarter mile through cypresses and floodplain forest, where red maples are cloaked in their fall colors by December. The boardwalk is surrounded with young trees, as the ancients were removed by loggers. There is very little left of this corner of Florida that has not been affected by human action. 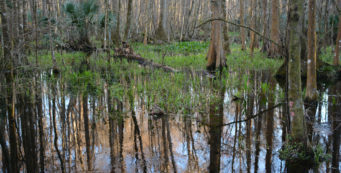 Sadly, privately owned swamp habitats continue to be filled in for development nearby. As the boardwalk ends, you pass two benches before it makes a hard right and deposits you onto a grassy tramway. A flock of ibis picks their way across the grass. The early settlers called them curlew – or Chokoluskee chicken, according to locals. Beyond the boardwalk is an alligator slide, where alligators regularly cross from one deep pool of water to another. A bench is nearby. 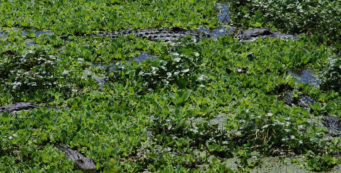 Keep at least a 15 foot distance between yourself and any alligators you see, if at all possible. Alligators may be sunning just out of the water along the sides of the tramway, especially through this section. 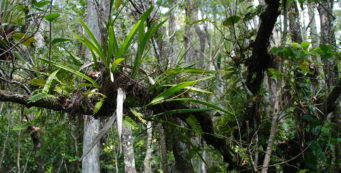 The trail is a long corridor of green grass through the middle of the swamp, where dense ferns make up the understory under the cypress trees. Passing a bench under a large cypress tree, note how the habitat shifts to floodplain forest, heavy with red maple. Alligator flag dominates the deeper water. Giant sword fern and royal ferns create their own little islands in the swamp. It’s here, about a mile in, you encounter an interpretive display with railroad ties from the logging days, between 1915 and 1957. The trail continues as a broad straightaway through the floodplain forest before it emerges to where the landscape opens up on the right. The sparkling waters are Saddlebrook Lake, edged by homes on the far shore. On this shore, the marsh presses in more closely to the trail, so there are a lot of damp spots underfoot as the tramway is not far above water level. Reaching a fence line at the property line, you see a bench and a sign with GPS coordinates on a map to let you know where you are. The sign explains each leg of the trail system, providing mileages, so you can decide how far to go – up to 12 miles for the entire route. The trail makes a sharp left here and follows the fence east. You pass a “Service Road” sign to the left at 1.5 miles. Through gaps in the vegetation you can still glimpse Saddlebrook Lake off to the right beyond the fence, with a line of cypresses on the far side of the lake. “Road Closed” and “Service Road” signs appear with greater frequency, mainly to discourage you from following unmarked old tramways, logging spurs, that lead from the main trail to dead ends in the swamp, and are not maintained. Passing one such tramway spur, you see a pond covered in water lettuce, and soon after walk between a pop-ash swamp on your left (one of the preferred habitats of Florida’s rare ghost orchid) and a floodplain forest on the right. The tramway is quite broad through this area. Pause for a break at a picnic table. A few minutes later you come to the junction for the big loop through the heart of the preserve, at 2.3 miles. Unlike what you’ve seen on the maps, the junction is not a square but a “Y” – which is what the loggers would have had to build to get the trains down the tramways. Marker 3, at this junction, is your decision point. It is 7.5 miles around the loop, with no shortcuts. You can opt to walk it all, walk out and back on a portion of it, or turn around here, as we did, to return the way you came to the trailhead. On the return walk, note how canals parallel the tramways for most of the way since the earth to create them was dug out of the swamp. Listen closely. Despite the human intrusion of tramways, this is truly a wild place, with a profusion of wildlife living it in. 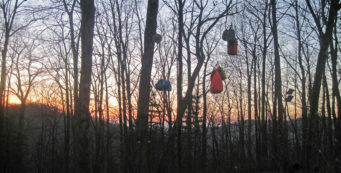 Birds sing from hidden branches. Wildlife is plopping, swimming, skittering, and flapping everywhere. Walking towards the trailhead, you’ll now notice numerous signs with a parking symbol and arrow to encourage people to walk the correct way back to the trailhead. The opposite direction takes you deeper into the swamp, not a place where you want to spend the night. This is the home of the Florida panther, the Florida black bear, and thousands of alligators. It may not feel like it on this grassy ribbon of trail, but Bird Rookery Swamp is a truly wild place, slowly healing itself from the scars of logging that only ended less than 60 years ago. Returning to the corner of the fence line, the trail makes a hard right past more signs, as if the trail builders were worried that you might walk into the swamp off the tramway. Past the open waters of Saddleback Lake, you return down the long straightaway through the swamp, reaching the boardwalk at 4 miles. After you leave the end of the boardwalk where it meets the causeway, take a few minutes for a ramble around the 0.2-mile loop to your right. It provides another perspective on the edges of the swamp – it’s here we spotted baby alligators, which means Mama gator couldn’t be far away – and more colorful herons. The loop ends by depositing you on the causeway that leads straight back to the parking area to complete a 4.5-mile hike. It’s part of the Big Cypress ecosystem, but not the national preserve. Thanks for the fee info.